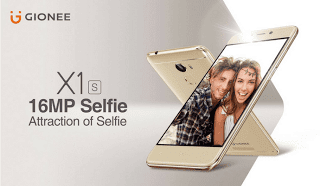 Gionee X1s is the bigger model of the X1 , the Gionee X1s main selling point is its 16MP selfie camera andits 4000MAH battery capacity . Gionee X1s comes running on Amigo 4.0 in light of Android 7.0 Nougat, has 5.2 inch bigger display screen with 720 × 1280 pixels resolutions. It also packs a 3GB RAM, 16GB inbuilt memory staorage expandable up to 256GB utilizing a MicroSD. It is powered by Mediatek MT6737T Chipset, Quad-center 1.5 GHz Cortex-A53 CPU and with a monstrous non-removeable 4000mAh battery strength. The screen is secured with Corning gorilla glass 3 with help for multi-touch. It has 13MP back camera and 16MP selfie camera with double LED flash. Checkout more of its features below . Judging from the specs of this phone under review, it won't be out of place if one states that this phone is meant for the selfies lovers. Another selling point is the presence of a dedicated slot for sd card.